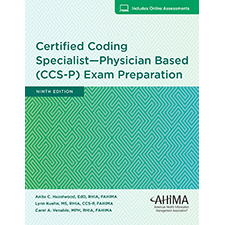 Certified Coding Specialist—Physician-based (CCS-P) Exam Preparation provides you with the guidance and practice you need to successfully prepare for the CCS-P certification exam. Whether you are a current student or have already started your career, the CCS-P exam prep simulates the exam experience to give you the confidence you need for success. This book includes four complete practice exams, each containing 97 multiple choice questions and 8 medical cases that are organized by the CCS-P competencies. All exams are updated to the 2019 code sets.